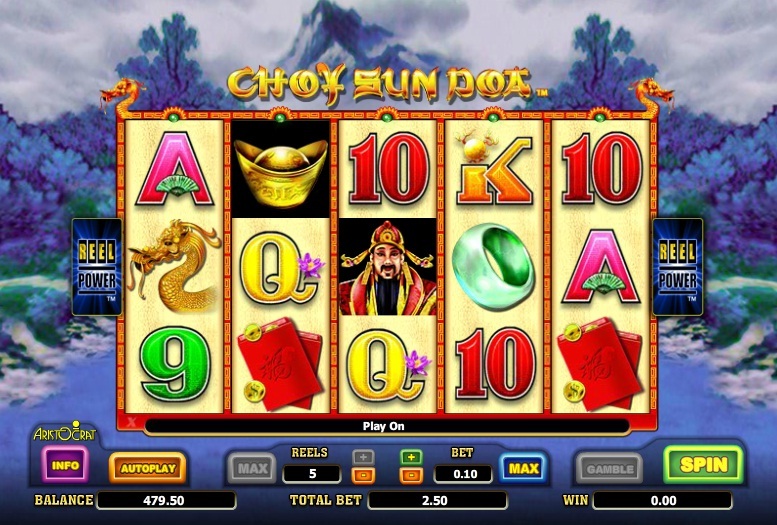 The Choy Sun Doa video slot is a regular in casinos around the States and is probably one of the most recognizable of the Aristocrat slots, along with the Egyptian-themed Queen of the Nile slot and the popular slot Lucky Count. All have very similar sounds when you win or hit the bonus round. 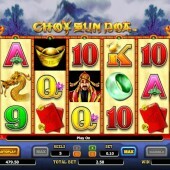 Online slot developer Aristocrat has launched Choy Sun Doa online, but it is still yet to be determined if the slot will generate the popularity that it commanded on the land-based casino floors. Hopefully, this will change in the future, but until then you will just have to play it for yourself and make your own mind up. Aristocrat have an established prestige when it comes to developing slots on the land-based platform so it is surely only a matter of time until their reputation trickles onto the online genre and their slots have a similar impact on online players as they did on players on casino floors across the world. Both the offline and online version play very similar, which I believe was the intention of slot maker Aristocrat. The game has 243 ways to win, so matching symbols left to right will pay regardless of where they are on the reel. Choy Sun Doa regularly pops up on reels 2, 3 and 4 and is a wild for any symbol except the onus scatter symbol. To get through to the bonus round, you need 3 Scatters on reels 1, 2 and 3 and this will initiate your free spins. You then have to choose which option you want, with the greater amount of free spins the lower your multipliers. I normally pick 15 here, but I do know players that go for the lower amount of spins and the higher multipliers. Of all the Aristocrat slots, Choy Sun Doa falls in the middle for me. I much prefer the aesthetically-slick Queen of the Nile II slot or the legendary 50 Lions slot. This game offers a vintage slots feel and you will certainly enjoy this if you are a slots purist. I prefer a little bit more bang for my buck though and I am not too sure I will be coming back for more. That could just be me though.